CSJM BA Hindi 3rd Year Exam Date 2019 this is our First Breaking News of 6 April during Navratri Period is Kanpur University B.A Third Parcha is Now Out. So all students are welcome here to read our Back paper cup Fresh Date she of CSJM B.A Paper 2 Date Sheet. For More details on how to Check Paper out CSJM Exam of B.A third you should visit official website http://www.kanpuruniversity.org/. 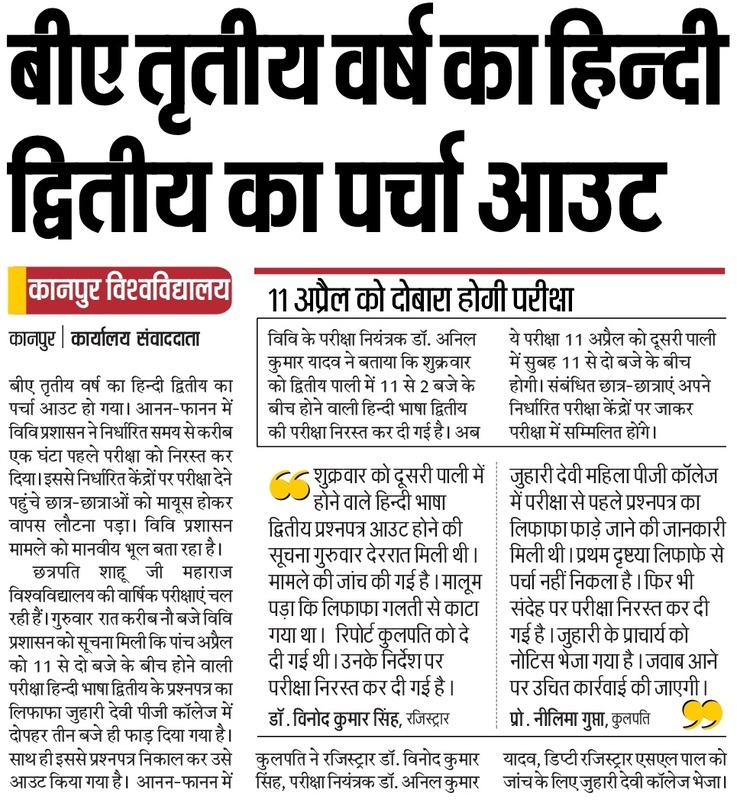 Kanpur University B.A Paper 2 Exam Date 2019: Latest News 6 April As per news CSJM Staff has taken back all B.A Second paper Set when they found evidence before 1 hour of starting. Vishvidyalaya Prashashan Saying this is Human Nature and there is no evidence on Paper distribution. 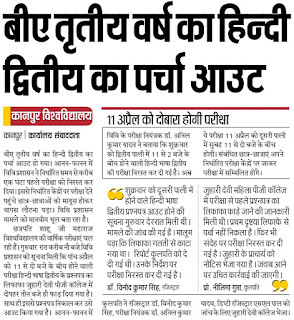 But due to this Paper cancelled news of B.A Hindi paper many students were disappointed and return back to their home. CSJM Re Exam Date 2019: On 11 April Re Exam of Parcha Our paper of B.A Hindi will be re considers. If you want any news regarding B.A Hindi Paper 2 Exam Date kindly read our notification daily and comment us below for more details. Subject Name: Bachelor of Arts (B.A). Name of the Paper: B.A Third Year. Type of Paper: Paper 2. Paper Cancelled Time and Date: Second Shift between 11.00 AM to 2 PM. New Exam Date: 11 April 2019, Doosri Pali, 11.00 AM to 2 PM. Is there any Change in Exam Centers: No there is no Change in Exam Centers? Note: In Juhari Devi PG College Paper Seal was already broken before 1 year of time and many people says it was paper out.